Cookies for breakfast is not such a novel thing, I know. And at my house it’s often my husband and children who sneakily grab a few homemade cookies to start their day. So I took it upon myself to create a cookie that we could all feel good about–breakfast or otherwise. 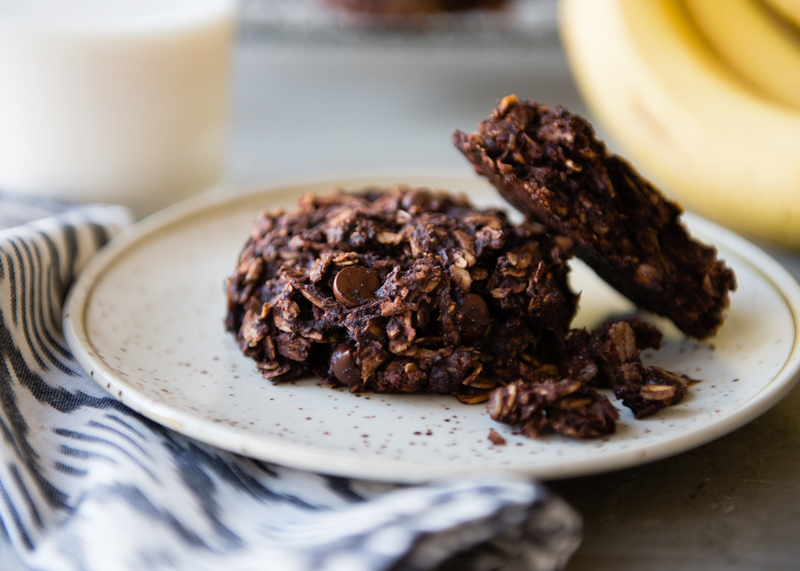 Enter these healthy breakfast cookies made with plenty of chocolate, fiber-rich oats, nuts, coconut, chia, and naturally sweetened with ripe bananas. I started with a recipe published on 101 Cookbooks a few years ago that I’d forgotten all about it until I began searching online. From there, I made batch after batch, adding a little of this and that, and making a few changes to ingredient amounts until I landed on what I think is a perfect breakfast cookie. Before we go any further, there’s something you must know about these cookies. They aren’t your run-of-the-mill overly sweet chocolate chip cookies. They are naturally sweetened with mashed bananas. While testing out different breakfast cookie recipes, my family complained a bit that the cookies weren’t sweet enough. I took that to mean these were perfectly sweet. Ha! I do like something a little sweet in the morning, and these hit the spot without being cloying or giving me a sugar rush. But if you prefer things on the sweeter side, you can certainly add a little maple syrup or your favorite sweetener of choice, though I really don’t think they need it. The chocolate chunks add a nice hint of sweetness to every bite too. Now that we’ve got that out the way, let’s dig into why you’re going to want to make a batch of these ASAP. First, healthy. Yes. Healthy is a relative term. But these really are healthy. Rolled oats provide plenty of fiber. The almond meal and almonds add more fiber, vitamin E, protein, and healthy fat. Coconut oil adds even more healthy fat that provides quickly available energy due to the way its medium chain fatty acids are absorbed in the body. Bananas are chockfull of potassium and help keep your blood sugar levels stable. Chia seeds add additional fiber, omega-3 fatty acids, and help hold the cookies together. Second, we’ve got chocolate…lots of chocolate! Dark chocolate is great for heart health as well as antioxidants. Oh, and as you know, chocolate is ultra delicious. You don’t need to feel the least bit guilty for eating one (or two) of these for breakfast. They’re a great, filling way to start our your morning. As I said, I’ve made numerous versions of these breakfast cookies. Ultimately my favorite combination is a sort of Almond Joy kind of cookie–almonds, chocolate, and coconut. Never a bad way to go. 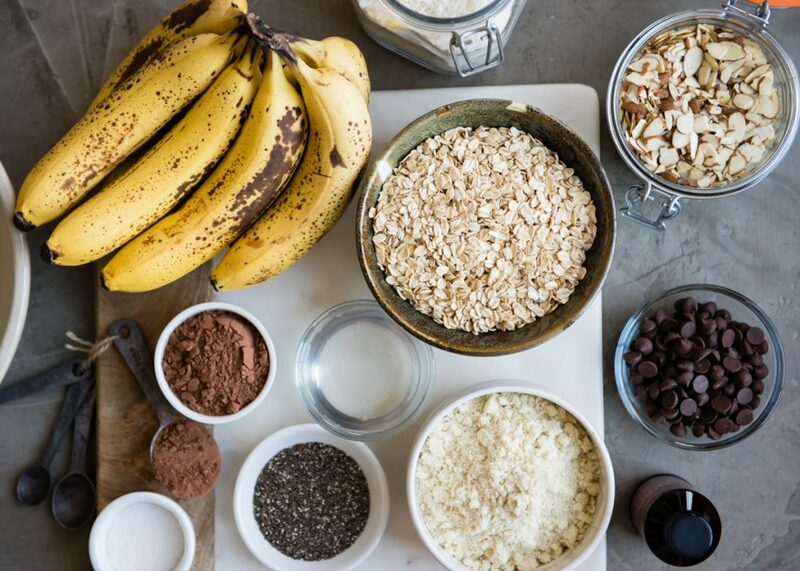 But feel free to add chopped dried fruit instead of or in addition to the chocolate chunks–or the chocolate can be omitted completely if it’s not your thing. Use a different kind of nut, if desired. It’s totally personal preference. Another thing to note about these cookies is that the dough isn’t sticky like regular cookie dough. It’s more wet and gooey. The cookies don’t spread out. The texture is very soft and almost muffin-like, so this recipe can also be made in 9-by-13-inch pan and made into bars. (I prefer the cookies myself.) Also, these keep very, very well frozen. 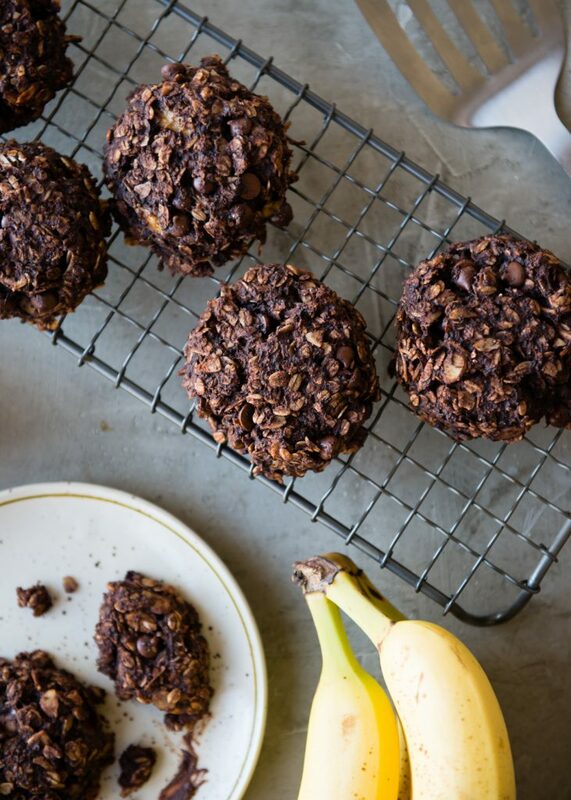 If you find yourself with a surplus of ripe bananas, this is the perfect way to use them up! 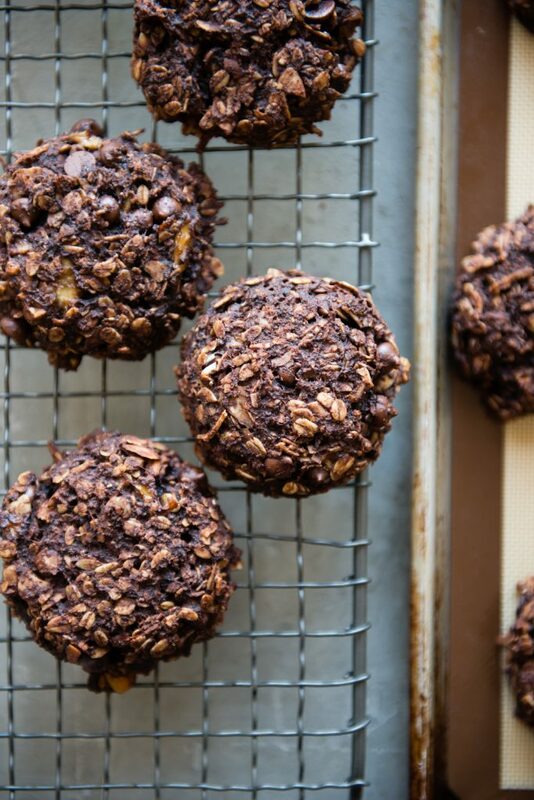 Start your day with healthy cookies that are loaded with oats, nuts, coconut, and chocolate. Naturally sweet, filling, and delicious. Preheat oven to 350°F. Line one baking sheet with parchment paper or a silicone baking mat. 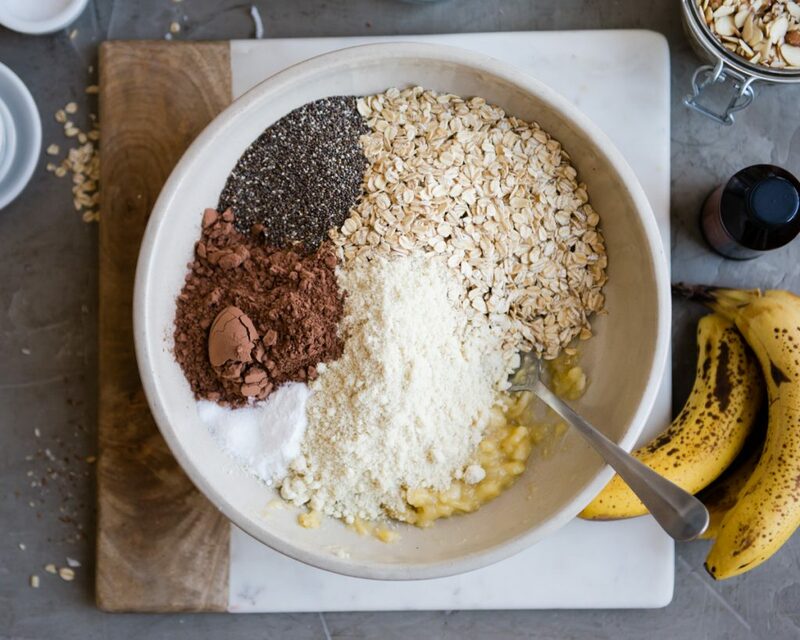 In a large mixing bowl, stir together the oats, almond meal, cacao powder, chia seeds, baking powder, and sea salt. Set aside. 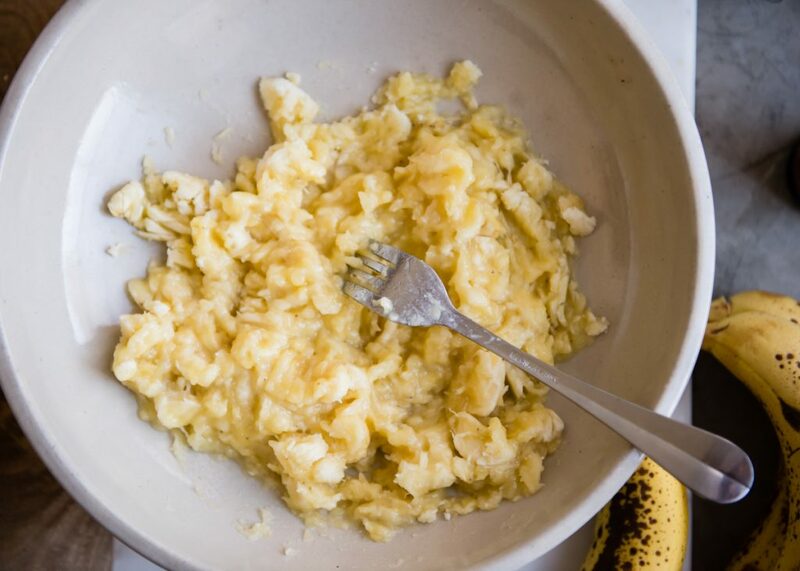 In another bowl, combine the mashed banana, melted coconut oil, and vanilla. Make a well in the center of the dry ingredients and pour the banana mixture into it. Stir until well-combined. 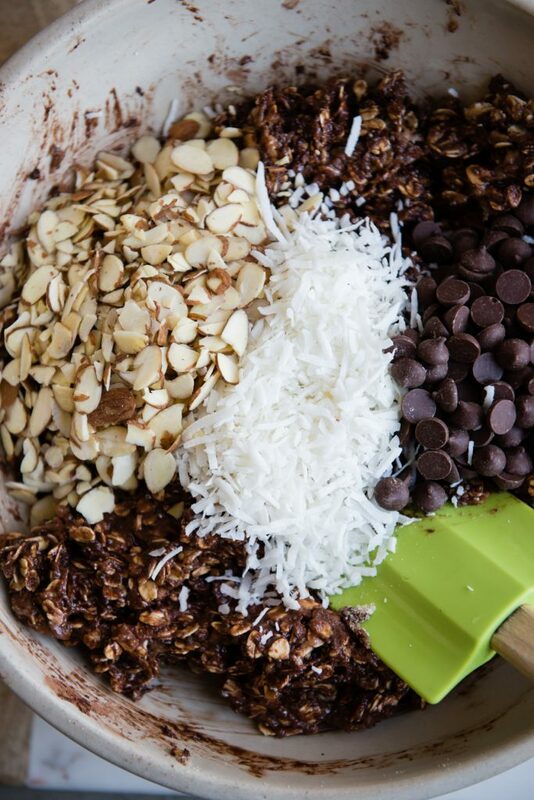 Fold in the chocolate chunks, coconut, and sliced almonds. Using a standard-size ice cream scoop, drop mounds of the dough out onto the baking sheets leaving a little room between. There should be 9-10 cookies. Bake for 15-18 minutes, or until cookies are baked through. Rotate baking sheet halfway through baking time. Test for doneness by lightly pressing on the center of the cookies. They should feel set. Allow the cookies to cool on the baking sheet, then store in airtight container. Dried fruit can be added or substituted for the chocolate chips.Almond flour/meal can be substituted with whole wheat or oat flour.